I spend a ridiculous amount of time looking at listings, and I'm finding this one refreshing. No "A little TLC and this gem will shine!" No "Act now because this one's going fast!" No "A total remodel!" 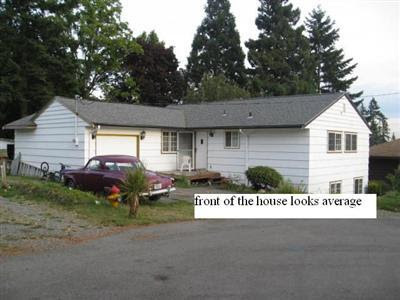 Just "front of house looks average." Ho hum. If Kate Winslet were a house she'd say that in her listing. love, love, love the car! After hearing for years that it was just average, this house will never live up to its full potential. But the purple 1950 Studebaker in the driveway is exceptional! That's a "pushme-pullu" Champion, right? Glad to see that not much has changed since that night the Bumpus's dogs all came in and took the turkey. Looks like they edited the pic! Aw, it's a shame that they edited that out. After all, commenting that it was average was actually one of the more exceptional things about the listing. It made it stand out. Now it's truly average with advice to bring your toolbox. Ho hum. When will they labeling like that in personal ads? Maybe they're trying to advertise to people in hiding. I like it when people tell me what to think. It saves me so much time and effort! What is that on the front porch holding the door open? Is it a chair ghost?